Our mission is to care for and empower orphans by providing housing, education and life skills. Celebrate Cinco De Mayo With Us! Raise the roof on Casa de Kids from Casa de Kids on Vimeo. Sign up for our newsletter and receive updates about Casa de Kids. 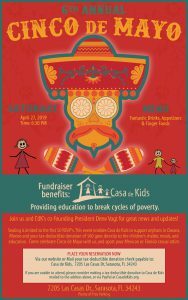 Casa de Kids is a new Sarasota, Florida 501(c)3 non-profit.